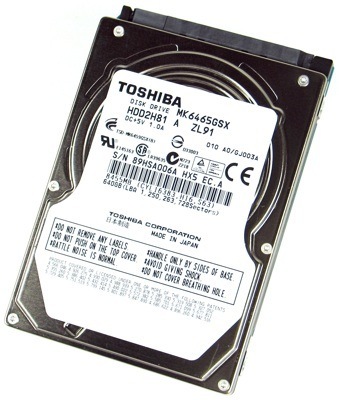 Review Toshiba is the first manufacturer to deliver a 2.5in laptop hard drive that packs more than 500GB of storage. Its new MK6465GSX sports 640GB on two platters, and while we are aware that the Western Digital Scorpio Blue and Seagate Momentus 5400.7 are also available in 640GB models we haven’t seen either drive to date. Toshiba's MK646GSX: storage boost for your notebook? The Toshiba is, clearly, built around a 320GB platter and comes in five versions. The 640GB and 500GB models use two platters and four heads, although our maths suggests that the 500GB might use two platters and three heads. The 320GB and 250GB versions have a single platter and two heads, and the baby 160GB drive brings up the rear with a single platter and single head. All five drives have the same physical form-factor and measure 9.5mm in thickness. They also share a 5400rpm spin speed, 8MB of cache and a 3Gb/s Sata interface that is compliant with the Sata 2.6 standard. It’s interesting to note that the single-platter models have an idle acoustic figure of 19dB and a seek figure of 20dB while the dual platter drives emit 25dB at idle and also while they are working for their living. While we were testing the 640GB drive, we were indeed impressed that the drive was very quiet. Realistically, though, that’s true of most laptop drives. 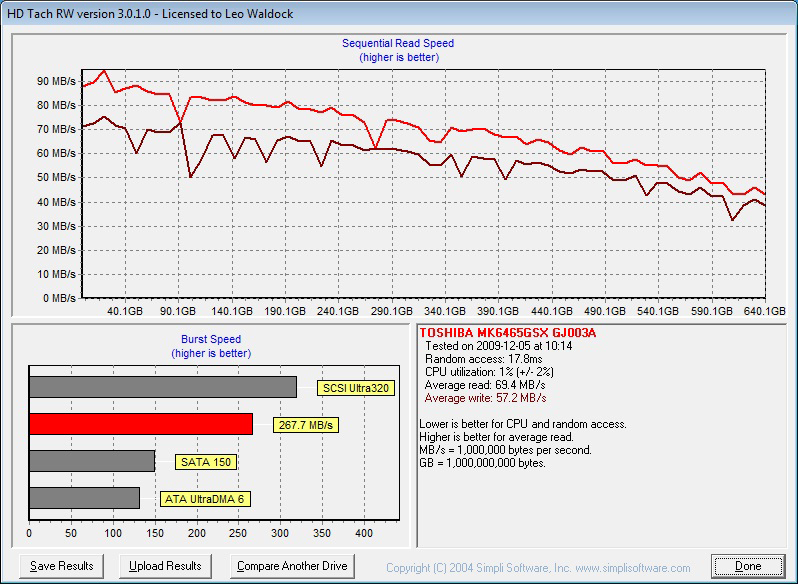 A quiet desktop drive is typically rated at 27-29dB, while a more audible drive will break the 30dB mark. WD's 2TB Caviar Black is fairly noisy and is rated at 33dB, so Toshiba’s figures of 25dB and 20dB look good to our eyes. 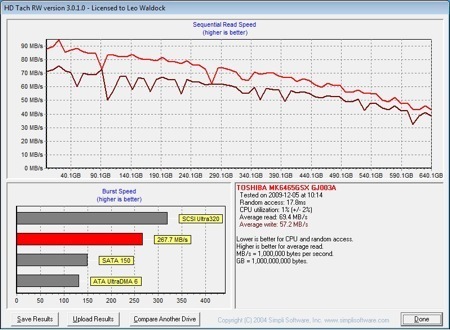 We tested the 640GB Toshiba on our regular Core i7 PC and generated a set of test results that compare fairly poorly to the hard drives and SSDs that we have reviewed in recent times.